Natural gas hydrates, also called combustible ice, are formed with natural gas and water molecules at suitable pressure and temperature, which can achieve the theoretical storage capacity of 160-180 v/v and stable storage under relatively milder conditions (e.g. 275.15 K and 3.2 MPa), which therefore produce great potential in natural gas storage and transportation. 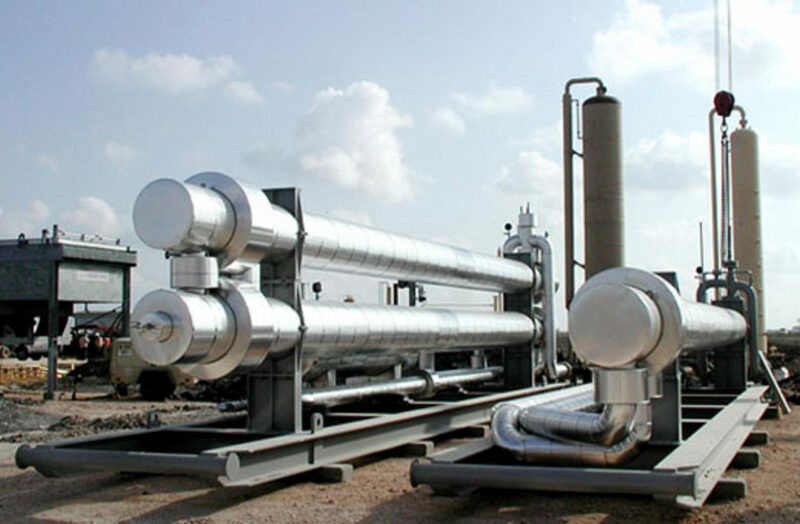 How to achieve the rapid formation of natural gas hydrates together with high storage capacity is critical to the industrial application of the hydrate-based natural gas storage and transportation. Researchers usually use surfactants (e.g. sodium dodecyl sulfate – SDS), metal nanoparticles (e.g. nano-Ag) or porous materials (e.g. activated carbon) to promote the natural gas hydrate formation, which can enhance the mass or heat transfer during the hydrate formation. However, the use of surfactants also leads to the generation of lots of foam during hydrate dissociation, which not only impacts the application of gas hydrates but also causes the loss of surfactants; while the metal nanoparticles usually produce poor stability during hydrate formation-dissociation and therefore poor recycling performance. The researchers from Qingdao Institute of Bioenergy Bioprocess Technology (QIBEBT), Chinese Academy of Sciences (CAS) use polystyrene nanospheres of about 100 nm as the carrier and graft the functional groups of SDS (-SO3–) and nano-Ag particles of 2-5 nm on the surface of the nanospheres via emulsion polymerization and electrostatic adsorption & in situ reduction to prepare novel nano-promoter for natural gas hydrate formation, of which the schematic diagram and TEM photo are shown by shown in Fig. 1A. 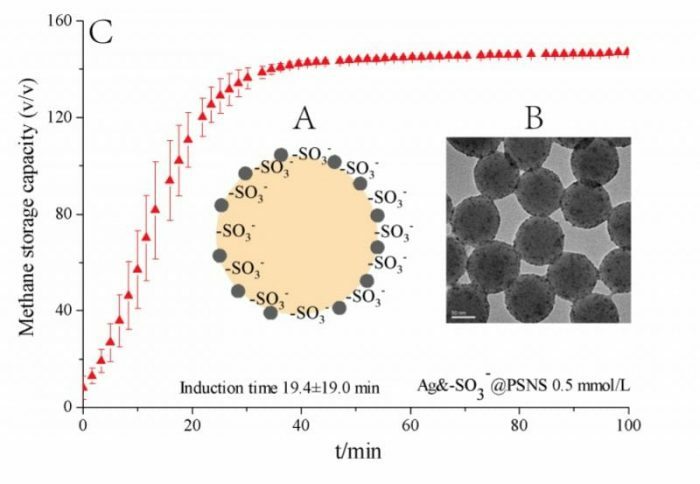 As grafted on the surface of the nanospheres, the -SO3– and nano-Ag particles can exist in the liquid phase more stable and contact with the water and gas molecules more efficiently. As a result, the nano-promoter produces rather efficient promotion to natural gas hydrate formation, which at the dosage of mere 0.5 mmol/L can reduce the hydrate formation period from days even weeks when pure deionized water is used to 40-60 min and achieve the storage capacity of about 150-160 v/v, as shown by Fig. 1B. Moreover, the nano-promoter successfully avoids the foam generation during hydrate dissociation and therefore produces very efficient recycling performance in at least 10 cycles of hydrate formation-dissociation, shown in Fig. 1C. In summary, the nano-promoter endows the industrial application of hydrate-based natural gas storage and transportation with significant feasibility. 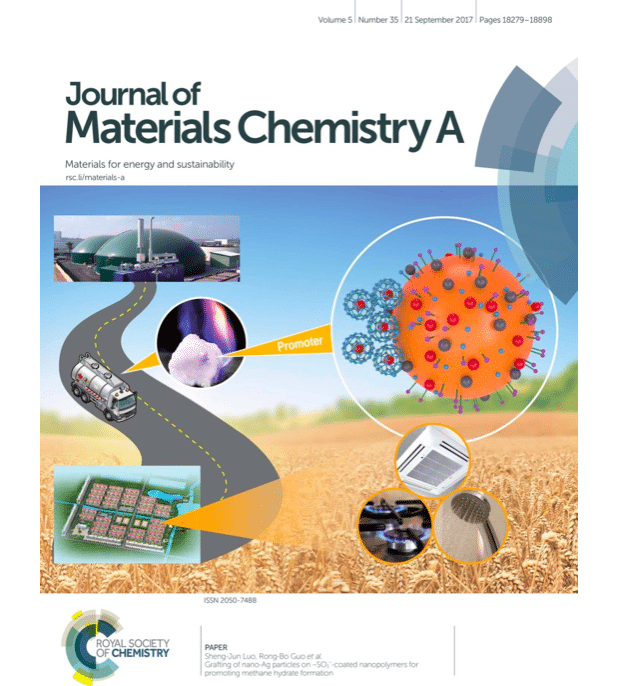 This work has been published in Journal of Materials Chemistry A and highlighted as the inside front cover, shown in Fig. 2. These findings are described in the article entitled Grafting of nano-Ag particles on -SO3–-coated nanopolymers for promoting methane hydrate formation, published in Journal of Material Chemistry A. This work was conducted by Fei Wang, Gang Guo, Sheng-Jun Luo and Rong-Bo Guo from the Qingdao Institute of Bioenergy and Bioprocess Technology, Chinese Academy of Sciences. Fei Wang currently works at the Qingdao Institute of Bioenergy and Bioproccess Technology, Chinese Academy of Sciences. Fei does research in Chemical Engineering. Their current project is 'Research on the promotion effects of nanosphere-based fixed surfactants on methane hydrate formation. (China Postdoctoral Science Foundation funded project, No. 2017M612370)'.